There is something truly magical about the city of Melbourne. Around every corner is a hidden laneway bustling with people, shops and of course delectable coffee. There is something to see and do for everyone no matter how young or old. Of course exploring Melbourne city as a family is very different to exploring it as care-free singletons or a loved up couple. 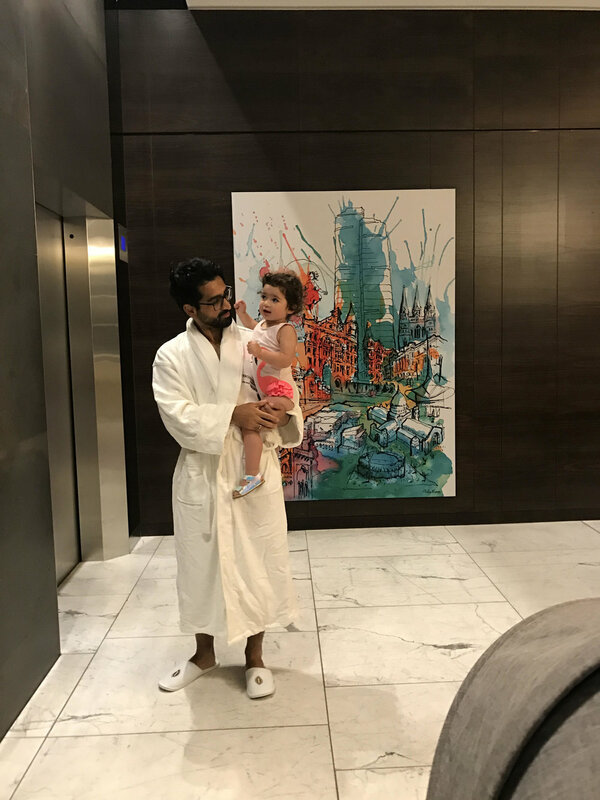 Gone are the days of late night wanders from one establishment to another, and hello to family friendly events that end early and have us tucked up in bed before 10pm. Although they’re still exhausting! So, in order to slow down, we spent the weekend at the Intercontinental Melbourne The Rialto hotel. It was so nice to not have to worry about who’s cooking what and whose turn it is was to clean. We wanted to challenge ourselves to rediscover our own city – see something we haven’t seen before, do something outside the usual routine of bedtimes and washing and… did I mention washing? We spent our first night just relaxing as a family, something that we don’t get to do all that often. We all hopped into bed and watched cartoons … like I said, life is very different with two young children. And what better way to end our first night than to order room service! In our robes and slippers, we feasted on an amazing meal, as well as cheeky chips for my daughter! Our first full day of exploring was slightly hindered by the unpredictable Melbourne weather. It really is true when they say that you feel four seasons in one day! But of course that didn’t stop us from getting out and walking the beautiful streets to discover more hidden gems. 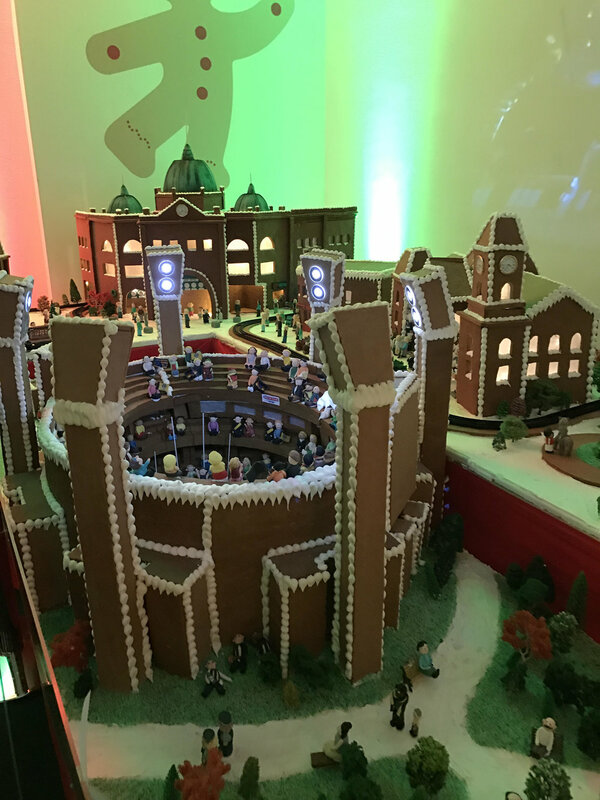 We visited the Gingerbread Village by Epicure at the stunning Melbourne Town Hall. Some of the city’s most recognisable landmarks were on display, and they looked delicious! It was then off to Bourke street to do some shopping! It’s so magical that our Australian summer coincides with Christmas, the streets were decorated, the shops were festive and the carols were humming. We stopped for coffee, lunch, coffee, ice cream and then of course more coffee (this city is superb for new mums … I didn’t once feel tired). The Upper West Side Street Art Precinct was one of my favourite places. We arrived just as the artists were in the middle of designing their pieces. It’s amazing to see creativity come to life. Now as a mother of 2 children under 2, the thought of having a moment to myself is usually a fleeting one that occurs while I’m in the midst of piles of washing! But, I got to experience an hour of indulgence at the Botanica Day Spa. It was glorious. A full hour of peace and tranquillity while being pampered. We are certainly spoilt for choice in Melbourne when it comes to restaurants. We struggled to decide where to eat dinner, but we couldn’t go past Gazi. Sophisticated and fun Greek street food from celebrity chef George Calombaris. My taste buds are watering just reminiscing how delicious the food was. Myself and my husband have always been foodies, so when it came to ordering we had to go all out and have a bit of everything! And we were not disappointed. From breads and dips to perfectly cooked tuna and hearty souvlaki, the food was delicious. It was such a fun and vibrant place to spend our evening, and yes we took the kids! The staff were so friendly and accommodating, it’s safe to say this is a new favourite. After an incredible day seeing Melbourne with fresh eyes, we were home and tucked up by 10pm. IHG’s Summer of Possibilities was the perfect inspiration for us to make the most of our time together as a family and really reconnect with one another. I now challenge Lana (@lanajf) to explore her summer of possibilities .